www.whatslifeabout.org Montaz & Naomi scuba diving with 'funnydivers' at Hurghada in the Red Sea, Egypt, during our holiday in 2009. Two of the most popular shipwrecks inside the Fathom Five National Marine Park in Tobermory, Canada. Arabia: In 1854, sailed to Glasgow, Scotland with a cargo of wheat and flour. After returning to Canada, the following year, in 1884, near Echo Island she floundered and sank. This is one of the most interesting shipwrecks in Tobermory. Forest City: Propeller Steamer Built: 1890 and Sunk: 1904. The broken bow begins in 60 feet of water and drops to a relatively intact stern in 150 feet of water. One of the most interesting parts of the wreck lies between 100′ and 150′. It’s been the mainstay of British tourists for more than 30 years, but what does the Costa del Sol offer holiday divers. We ask DIVE readers what they think. Egypt’s best shore diving traditionally takes place from the sandy idyll of its desert camps and resorts. Simon Rogerson chooses his top five sites. Great diving, hospitable people and the chance to visit ancient ruins, all combine to make Jordan an excellent diving holiday destination. Four DIVE readers give their verdicts. For a reasonably priced holiday with guaranteed sun and blue water, the Canary Islands offer plenty of scope. With good wrecks and stunning marine life the west of Ireland is renowned for its diving. Four DIVE readers give their verdicts. It was a chilly April in Cyprus, and my notion to take my girlfriend away for a spot of winter sun had been foiled by unnaturally cool weather. Sardinia is known for both its good-quality Mediterranean diving and its Italian hospitality. DIVE readers give their verdicts. I have had the pleasure of manta encounters in the Maldives and in many places around the world. But it took just one dive in the tongue-twisting Revillagigedos archipelago to fall for the magical manta experience on offer there. I recently visited Palau to do a feature for DIVE (Current Affairs, August 2005)and booked on the Ocean Hunter II. Hordes of Brits visit these islands every year, but what’s the underwater action like? DIVE readers give us the lowdown. You can go on holiday and find yourself swimming in warm, blue water without even having to catch a flight. DIVE contributor Graeme Bruce proved this by driving from Tyneside to Porquerolles. A leak in a flow pipe has released more than 200 tonnes of oil into the North Sea. A Global Diving Conference is being held in Kiel, Germany, on 12-13 November. The line up of speakers includes recreational, technical, cave and wreck divers as well as scientists and marine conservationists. 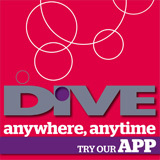 DIVE magazine, a globally recognised brand, is launching a vast digital campaign, offering free subscriptions. Is this BSAC's youngest diver? DIVE has teamed up with Mares to give readers the chance to win some brand-new kit - a Mares regulator set. If you like rummaging in wrecks or looking inside the nooks and crannies of reefs, you’re sure to find this month’s prize draw illuminating. DIVE has teamed up with Silent Planet to offer readers the chance to win a Halcyon Eos LED torch. This year’s British Underwater Image Festival attracted hundreds of entries across all of the categories, showcasing the very best in underwater photography and filmmaking. Dive centres and travel operators report business as usual in resorts around the Egyptian Red Sea. Protests taking place in Cairo, Alexandria and other large cities have not affected divers and holidaymakers in Sharm El Sheikh, Hurghada or other resorts. Shore diving is an easy, cheap and convenient option when abroad, offering you the freedom and flexibility to dive where and when you want – and Malta is one destination that’s particularly suited to it, says Jo Mattock. "I agree with the above review. This computer is easy to use and read. Great if your eyesight is..."
"I mate of mine had a pair and hated them. I tried them, really wanting to like them, just to hac..."
Yes, only republican take medicine.